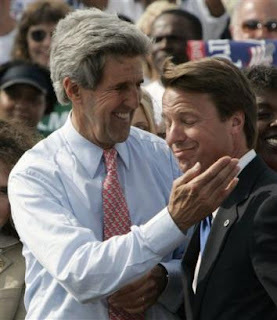 On the Iowa campaign trail, Barack Obama has been regularly referring to fellow presidential aspirant John Edwards as "kind of handsome." Obama isn't quite stating his own opinion -- he's channeling the impression he thinks an Iowa caucus goer would have of Edwards. There's nothing wrong with that. Anyone faced with a two-year campaign marathon would shake things up with a little role playing now and then. Although I'm sure Mrs. Edwards thinks John is unequivocally handsome, and Obama has scolded journalists about the unseriousness of pointing out his own supposed good looks in the past. Only Obama changed things up during a recent Iowa stop and referred to Edwards as "kind of cute." Now there are certain things a man -- unless that man has a Mike Tyson-level of insanity and punching power -- simply should not call another rival man, no matter what the circumstance or scenario. And "kind of cute" is close to the top of that list. The fact that Obama thinks it is OK to say this constitutes a cultural misunderstanding so severe that it shifts the debate from whether Obama is authentically African-American to whether Obama -- who spent his formative elementary school years in Indonesia -- is American at all. Or, it could be, John Edwards needs to wrestle an alligator or pistol whip Bill Richardson and quick --because it's not just right-wing, self-promoting harpy types who can't help but to imply John Edwards is a sissy.